Since September 2012, I have been mostly vegetarian. I was fully vegetarian for a little more than a month, before I morphed into what I am now. I guess the technical term is 'flexitarian'. I don't, as a rule, buy meat at the store. I'll eat meat when I'm served it as a guest, or when I go out to eat. I haven't talked about it here; I haven't made any grandiose statements about saving the planet or animal cruelty or anything. But now I'm going to take just 5 minutes to tell you why I think cooking vegetarian food is a great idea. 1. 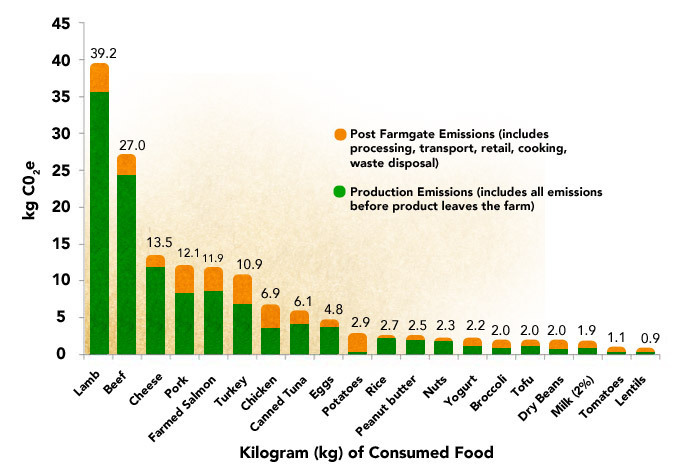 Save the planet: Vegetarian diets have a much lower carbon footprint than meat-heavy diets. Unfortunately I fly quite a bit, so really all the not-owning-a-car and vegetarianism in the world won't cancel that footprint, but at least I feel like I'm being slightly more proactive about global warming. 2. Plants = sustainable: Animals eat plants, so it takes a greater mass of plant to grow meat. By eating plants directly, we can feed more people on the planet. I believe if the quality of living for the average human being on the planet is to rise, everyone needs to cut back on their meat consumption. The sustainability of the food groups. Image from this interesting article. 3. Discover great new foods: As a meat eater, shopping is really easy. You get your meat, your potatoes/pasta/rice, maybe some veggies, and voilà! As a vegetarian I'm forced to think more outside of the box, explore new tastes, and cook with more vegetables. 4. It's actually cheaper: When I bought meat, it was generally the most expensive item on my shopping bill (this applies in France and Norway, haven't tested thoroughly in other countries). 5. Healthy! More creative meals means more veggies, and more variety. Variety + veggies = healthy. 6. Savour meat more: Nowadays I will often splurge on high-quality meat if I'm going to eat it at all. By cutting back on meat, it tastes even better when you do go for the filet mignon. But Molly, I don't have time to dream up vegetarian recipes and cook them! you say. Well, this is where my blog comes in. In the past nearly year and a half of vegetarian cooking, I've stumbled across quite a few good recipes. So from now on, I'll make an effort to post a vegetarian recipe on the blog every week. So I render your argument invalid. Most of them will be dinner-type meals, because that's the hardest meal to make vegetarian. (Between you and me, the occasional chocolate cake may appear). Mmmmcake. My mother's Buche de Noël, or Yule Log, undergoing frosting this Christmas. All of the recipes are Audun-approved. This means that my meat-loving boyfriend has labeled them as yummy. This is the only seal of approval I need. Come back tomorrow for the first vegetarian dish!